Jakobshavn glacier in western Greenland is one of the fastest flowing glaciers in the world; it loses about 6.5% of the total Greenland ice sheet discharge, and in the last decade its speed has more than double to about 40 m/day in the summer in 2012. Dynamic thinning (i.e. thinning caused by ice flow dynamics) has spread in the last decade, and it is not known what are implications this has to the stability of the Greenland Ice Sheet interior. Here we present preliminary observations of dynamic response to the ice sheet interior of the retreat and acceleration of the Jakobshavn glacier in western Greenland. 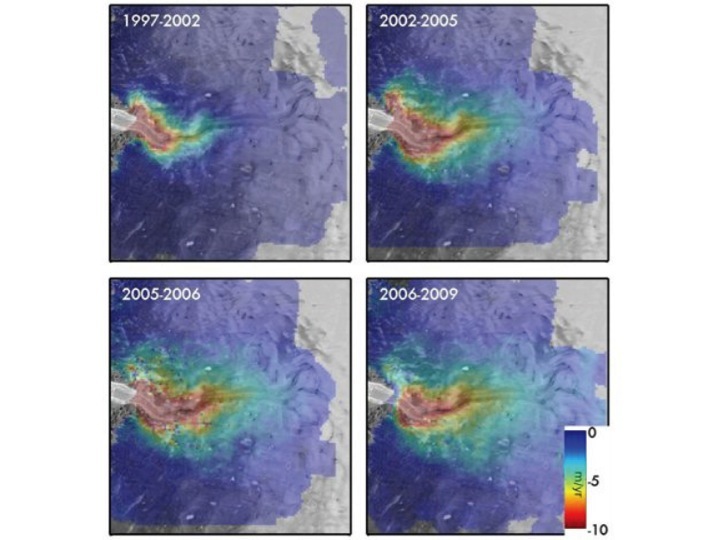 We present data from satellite radar altimetry and Icebridge airborne altimetry complemented with field observations of snow/firn compaction rate made along the ice flow line of the outlet glacier between the elevations of 1800 and 2300 m.a.s.l. Firn compaction and snow accumulation variability is large relative to thinning observed in the area, and altimetry observations alone do not discern between actual dynamic thinning and compaction rates.